Dental implants are the best solution for most people who have lost one or more teeth, providing a comprehensive and pleasant to improve your smile. In the absence of a front tooth implants provide excellent aesthetic results long lasting. 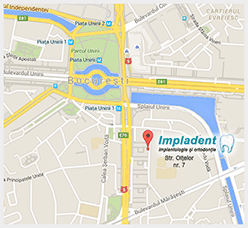 The care implant does not require the intervention of adjacent teeth healthy, to obtain a support. Using crowns anchored by multiple implants. Use of a bridge supported by two or more ‘installations. Using a fixed bridge on various plants. Removable prosthesis anchored on two to four or more implants.